Are you ready to play Electronic Arts' latest $60 roster update? Well hold your horses, because NBA Live 16 doesn't come out for another couple of weeks. But if you're just desperate to try it out in a sort of roundabout way, you can download the official companion app on the Play Store. Well, I say "companion app," but it doesn't have any of the management or social features you might expect from similar game-augmenting apps. Nope, the only thing it does is stick your face in the game. In and of itself, the "GameFaceHD" feature is actually pretty cool. Not original or unique (the Game Boy Camera was doing this almost 20 years ago), but cool. 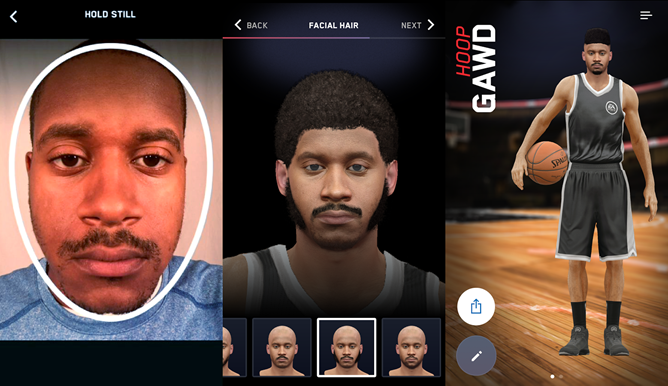 Snap a photo of your mug, customize your player's skin tone and hair, and then upload it to your EA account, and you can play as your own personalized basketball avatar, Hoop Gawd. Or at least you'll be able to when the game comes out. As a natural extension of the sort of aspirational wish fulfillment that sports games are designed to cater to, it makes a lot of sense. Unfortunately, it looks like the initial release is pretty awful, as is often the case when large game publishers make one-off Android apps. At the moment it has more one-star reviews on the Play Store than any other rating, with users complaining that the app fails to capture a usable image and often crashes. At least EA has a few weeks to get it right.